The Judiciary will rule on whether the Union is a club and clarify the word "benchmark" in the Union's constitution. Student Union President Hannah Brown ’19, Vice President Aaron Finkel ’20 and Chief of Staff Emma Russell ’19 presented four claims to the Union Judiciary on Jan. 15 regarding the Union’s status within the Union’s constitution in a case that will determine whether it is considered a club or governing body. Currently, the Union is considered a club and is therefore under the jurisdiction of the Allocations Board. Last semester, the Union did not receive the full $50,000 it requested for Fiscal Year 2019, and the A-Board then denied them $12,000 in emergency funding. The Executive Board met with the A-Board to discuss how each body interprets the constitution, but the two did not come to an agreement, which led members of the E-Board to take the case to the Judiciary, Brown said in a Jan. 31 joint interview with Finkel and the Justice. In the interview, Brown said that though the constitution specifically states that the A-Board determines allocations for clubs recognized by the Union, the “Union wasn’t ever recognized by itself, it was recognized by the student body, and not only that, but it governs clubs.” In addition, it is not listed in the constitution under Article VI, Section 3, which defines and names secured clubs. The petitioners argue that the A-Board should not have control over how much money the Union receives. “When the administration gives us SAF [Student Activities Fund] money, they give it to the Union, they don’t give it to A-Board. 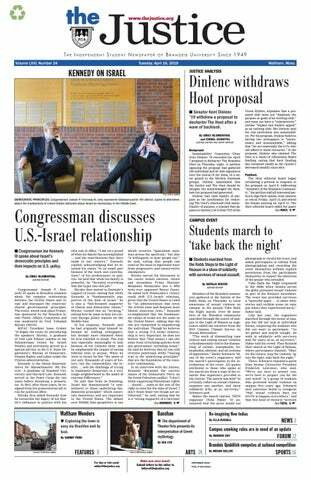 A-Board is just our mechanism for establishing the budget,” Finkel said. The third and fourth claims deal with the definition of the word “benchmark,” which Brown said “everyone agrees” is “confusing.” The third claim states that “the Student Union is guaranteed the entirety of its benchmark by the Constitution,” while the fourth that “a benchmark is the minimum amount guaranteed to a Secured Club. The Allocations Board makes decisions on requests by Secured Clubs for more than their benchmarks.” Article VII, Section 2 of the Union’s constitution mandates a “benchmark” of $50,000 in funding for the Union per fiscal year — as well as varying benchmarks for secured clubs, listed separately. Under the constitution, the Justice is the only club with an explicitly stated maximum amount of $50,000 in possible funding, while other secured clubs are “eligible to receive” their respective benchmarks, “with the opportunity to request more funding” through A-Board. The petitioners, however, claim that the Union is guaranteed the entirety of its benchmark by the constitution, and that the “benchmark” defines a minimum amount guaranteed to a secured club. The Union should be allocated the amount of funding stated in the Constitution, “which is $50,000, which is what people voted on,” Finkel said. The constitution — and any amendments — are approved by two-thirds student body vote. In a Feb. 1 interview with the Justice, Three-Semester Allocations Board Representative Roland Blanding ’21 provided a different interpretation of the benchmark, calling it a “standard, not a bottom line.” He said that his reasoning comes from incidents in the past when A-Board had fewer dispersible funds. In those cases, A-Board needed “flexibility” to take money from secured clubs so that all clubs could get funding, “so we don’t have several people claiming rights to money that’s not there,” according to Blanding. Money that remains unallocated after marathons is left for Community Emergency and Enhancement Fund projects or emergency requests, he added. “To give a group of six to eight people power to spend money that everyone pays in tuition is unethical,” Blanding said. Though A-Board may deny funding for some requests, “our prerogative is to give out as much money as possible,” he continued. Finkel provided the Justice with the Student Union Management System receipt for that purchase in fall 2017. The total cost for the TV and the renovation of the hollow wall cost $3,969, not the $10,000 Blanding said. Finkel defended the television as an “investment that will last years into the future,” and clarified that the Union’s conference room was the only room in the Shapiro Campus Center without a TV for video conferencing. According to Blanding, members of the A-Board are drafting their own amendment “that would allow for more checks and balances on the Allocations Board … with regards to the vetoing process.” Blanding also said, however, that he thinks there currently is “reasonable oversight” over the Union. The case will be heard and decided on the evening of Feb. 24 so the Judiciary can get it done “as soon as possible,” according to Nadjar. “It’ll be interesting to see how this language can be interpreted,” he added. —This article has been updated to reflect the postponement of the judiciary hearing.